A few weeks ago, I had the great pleasure of sitting down and talking with Dr. Norma Sue Kenyon, who is in her official capacity a professor of surgery, medicine, microbiology and immunology at the University of Miami Miller School of Medicine, but is perhaps better known an immunologist who works at the affiliated Diabetes Research Institute (DRI), and also as the director of the Wallace H. Coulter Center for Translational Research (named for Wallace H. Coulter, who was the co-founder, former chairman and president of Coulter Corp. where Dr. Kenyon once worked). She's also the mother of two daughters. I had met Dr. Kenyon previously, but only to shake hands and say hello. Dr. Kenyon is completely charming, and her connection to type 1 diabetes goes beyond her professional interests, she also has a teenage daughter (Laura) who lives with type 1 diabetes, too. Dr. Kenyon knows all too well what the medical issues are at the cellular level, but like so many parents of kids with diabetes, she also understands the very real practical limitations which are associated with the prescribed treatment for type 1 diabetes, perhaps far better than most other researchers. This makes her particularly well-suited for her role in "Translational Research", which is defined as translating scientific discoveries into practical applications. JDRF likes to refer to this as taking research "from bench to bedside". She works to unite the intellectual challenge of academic research with the satisfaction of finding real-world uses for those scientific advances. Dr. Kenyon studied at Duke University, and in 1986, finished her Ph.D. in immunology at the Medical College of Virginia. She returned to Miami to do a fellowship at the DRI, but then went to work as a researcher at Miami-based Coulter Corp. (part of biomedical giant Beckman Coulter since October 1997). By 1993, Kenyon had two daughters: Laura and Caroline. She left Coulter that year and took a job as an associate professor at Duke. Shortly after accepting the job at Duke, she flew from Miami to North Carolina for a week-long trip to scout out her future lab; her kids stayed with family in Miami. On the last day of her trip, Kenyon learned that her daughter Laura was in the intensive care unit and had been diagnosed with type 1 diabetes. The experience had a very big influence on her understanding of exactly what goes on outside the doctors' offices, and why glycemic control is so often a lofty theory that doesn't always translate well into clinical practice. As a researcher, however, she expresses frustration because of the cellular damage that ongoing hyperglycemia causes to the various cells in the body. Although I had prepared a list of questions I wanted to discuss with Dr. Kenyon, instead, I decided to simply talk with her and get her perspective on various things. One question I asked her was if she could put the DRI's research prioritizations in perspective, particularly with regards to immunology. She responded by noting that she felt that the success of any cure-related treatment requires something to address the issue of autoimmunity. She told me that her work (and that of others at the DRI) is never done in isolation and draws heavily upon relevant work outside the DRI as well. That explains the DRI's willingness to partner with researchers elsewhere, such as the Stockholm, Sweden based Karolinska Institutet. She noted several key areas the DRI is pursuing concurrently, including: islet transplantation, "tolerance" (which I described as "hospitality" towards regenerated or transplanted beta cells -- Dr. Kenyon liked that description, BTW), and perhaps most notable, the DRI's local drug discovery program. The local drug discovery program aims develop safe and effective methods to prevent the immune system attack on the insulin-producing beta cells. While newer drugs have been developed and are in use, many still cause unwanted side-effects and are toxic to the body's organs, tissues and cells. The current drugs also suppress the entire immune system, leaving patients at risk for infections and even cancer. A more detailed announcement about the DRI's drug discovery program can be read here, along with a link to a television interview with Dr. Kenyon. With that, I asked her about the recent JDRF-sponsored deal between MacroGenics and Eli Lilly and Company in which the two companies entered a global strategic alliance to develop and commercialize teplizumab, an anti-CD3 monoclonal antibody. JDRF's support was a critical factor because the organization helped fund the pivotal Phase II and plans to continue support of the Phase III clinical trials (see here for more information), although Lilly will fund some of the Phase III research and share any profits with Macrogenics. It is worth mentioning that anti-CD3 monocloncal antibody therapy has shown some success in JDRF-funded studies in Europe, although some of the pioneering work had been done by Jeffrey Bluestone at UC San Francisco. While these discoveries show success, the treatment itself remains largely out-of-reach because no company manufactures it or sells it; it remains a labor-intensive, hand-manufactured treatment. Furthermore, no one is looking at whether it might work on longstanding patients with autoimmune diabetes, but with a commercial partner like Lilly, I would expect to see this change. Dr. Kenyon acknowledged that the deal could make such treatments more widely accessible beyond limited research and could enable further research so she was therefore excited by it, but also added that they were also interested into ways of further refining these treatments, and also seeking to identify if they could find out why they work better in certain groups of patients, then to determine whether occasional "booster" treatments could keep the errant immune system at bay. At one point, Dr. Kenyon herself mentioned the work of Dr. Aaron Vinik who is perhaps best known as one of the co-discoverers of INGAP, or Islet Neogenesis Associated Protein. You may recall that I wrote about INGAP back on March 19, 2008 providing some historical background and an update. Of particular relevance is a news release today about the company who is now developing INGAP, Kinexum Metabolics, Inc. and an agreement that company is reached with another company to jointly develop a new combination therapy that has shown, in PREclinical studies, to cause type 1 diabetes to go into remission by protecting and promoting the growth of new insulin-producing cells. Dr. Kenyon felt that INGAP may have particular relevance for patients who still have remaining beta cell function, such as myself (after almost 32 years with type 1, I still have a fairly detectable C-Peptide of 0.7, which is fairly high). She suggested that with the right treatment for autoimmunity, INGAP might work very well for people such as myself. However, she felt that her daughter would probably not be a good candidate for INGAP, as her daughter's C-Peptide level is virtually undetectable. Her thoughts were very interesting, because she felt that INGAP might work particularly well for people who still have fairly high levels of functional beta cells. 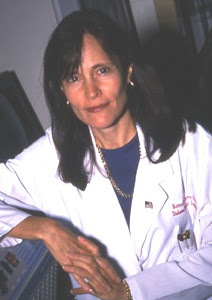 She indicated that it might be easier to restore insulin independence in people like myself, and she even noted that a combination of INGAP and teplizumab (mentioned above) could work as a 2-pronged treatment, but the key, at least in her opinion, was the necessity to have some remaining beta cell function. I also asked Dr. Kenyon about another female immunologist who has received a lot of (unsolicited) press for her work: Denise Faustman at Harvard/ Massachusetts General Hospital. My reasons for asking was because Dr. Faustman has already achieved a degree of celebrity which seldom occurs in the field of immunology, and also because like Dr. Kenyon, Dr. Faustman is a woman in a field that is largely dominated my men. Dr. Kenyon gave me some interesting information I was largely unaware of. She described Denise Faustman as a "child genius" who was admitted to medical school as a teenager. Its no secret that Dr. Faustman worked with some of the true pioneers in the field of diabetes cure-related research, including the late Paul Lacy, who is sometimes credited as being the father of islet transplantation. Dr. Kenyon acknowledged the gender issue that Dr. Faustman ran into, suggesting that the response to her work was essentially pooh-poohed, and to some extent, Dr. Kenyon felt that might not have occurred if Denise Faustman had been a man. She said that unfortunately, the field of medicine still remains something of an "old boys network" and that the receptivity to Dr. Faustman's ideas might have not have been so quickly dismissed if she was a man. On the positive side, however, Dr. Kenyon expressed hope in Dr. Faustman's work, but also cautioned that it may not work, or if it does work, it may work only in certain people -- all things to consider. The immune system is pretty complex, and even immunologists haven't yet discovered all they need to know, and Dr. Faustman herself is the first to admit that there may be several different ways to cure type 1 diabetes. Dr. Kenyon certainly agrees, and hopes that there will soon be a variety of cure choices for everyone, but in the meantime, she admits there's plenty of work to be done! Very interesting! Thanks for sharing Scott. It seems like it might be an interesting project for someone to find people like you who have retained detectible C-peptide levels for so many years after diagnosis and try to identify whether it is a genetic cause or has something to do with early diagnosis (the idea that injected insulin stops the attack on beta cells). It also may be that people like you have some new subtype of diabetes. Nice interview, Scott. Thanks for this!